Endicott House is a 1930’s era mansion built in the style of a French manor. The well appointed guest rooms in the mansion and in our contemporary building are designed for comfort and relaxation. Endicott House offers 37 guest rooms, 13 in the mansion and 24 in Brooks Center, which can accommodate up to 50 guests. Each facility is handicap accessible. Our guest rooms are quiet, comfortable, relaxing and equipped/designed for serving your business needs. Guests requiring single rooms can select the contemporary setting of Brooks Center, while more spacious and traditional rooms are available in the Endicott House. Our overnight conference packages are all inclusive, offering lodging, meals, conference space, audio visual, and support services. Looking for Boston’s smartest destination? Be our guest for a complimentary lunch and estate tour! "I have worked with the team at the MIT Endicott House for over eight years, and they are by far my favorite vendor. The professionalism and outstanding level of service they provide is second to none. When you work with the Endicott House, you can rely on the answer being “yes” before you even ask the question. They pride themselves on exceeding expectations and ensuring every event – no matter how big or small – goes off with a smile and without a hitch. Every level of staffer is dedicated to your satisfaction, and they deliver!" Recycling. Energy efficiency. Reducing your environmental footprint. These “green” terms have evolved over the last several decades and are now commonplace in many commercial, governmental and educational institutions. Although environmental sustainability has become mainstream and even expected, the ways that organizations implement green initiatives and adopt innovative ideas continues to add excitement to the movement. The Endicott House, an upscale venue for corporate events just outside of Boston, is embracing both proven and innovative environmentally focused initiatives. The Endicott House management team weaves green initiatives throughout everything we do in our operations, in our dining and lodging services, in our guest rooms and throughout our 25-acre property. We have found that meeting planners consider it a plus when they can find a conference and retreat partner who contributes meaningfully to a shared sustainability value. Our efforts are synergistic with our parent institution, Massachusetts Institute of Technology, giving MIT students opportunities to design, test and implement their ideas in real-life settings. 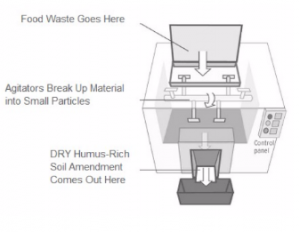 One of our most exciting innovative initiatives is the installation of an Ecovim organic waste dehydrator. This advanced technology allows us to process up to 65 pounds of food waste from the kitchen, in 9-10 hours. The collected water from this system is then used for nourishing our garden plants, and the solid remains are added to our composting system as rich soil, ready for growing more fresh produce. How about all the harsh soaps, bleaches and detergents used by most hotels or conference centers? Not here. We have practically eliminated all harmful chemicals and cleansers from our operations by implementing a state-of-the-art system that electrochemically transforms a simple solution of water and salt into a powerful compound that can be used safely on many surfaces. areas. Using the technology of electrolysis, tap water plus a salty brine, plus an electrical charge gradient produce hypochlorous acid- a safe antiseptic- and sodium hydroxide, a harmless grease-cutting ingredient in most soaps. Our entire facility including guest rooms, conference rooms, common areas and kitchen are without exception sanitized with electrolyzed water making Endicott House the greenest facility of its kind. Nearly two-thirds of our electricity is produced by renewable resources, and we adhere to a comprehensive recycling program that includes paper, plastic, cardboard, glass and metals. We also use energy efficient lighting options as well as a fountain water filter system. Our guest rooms are free from harsh of allergenic chemicals. Guest rooms in the Endicott House enjoy the overall old-school ambiance, including the antique light fixtures throughout the facility. We’ve equipped almost all of them with CFL or LED bulbs without losing the charm of our old world finery. That simple change has produced utility savings from efficiencies of 80-90 %. When was the last time you stayed at a facility that served fresh ingredients from their own gardens? Our chef-prepared luncheons and dinners are adding to our reputation as a premier meeting place in the Boston area for the simple reason that guests can look forward to not only supporting a company that takes care of the environment, but also enjoy the harvest of products that naturally come from that effort. Another delicious partnership we enjoy is with the MIT Beekeepers’ Club. That honey you just spread on your toast was produced by bees at work here on our property! And that’s not all! We convert all our used fryer oil to biodiesel fuel; we only use corn-based biodegradable serving products, and reduce our kitchen energy consumption with an efficient exhaust variable-load exhaust system. Like many hotels today, the Endicott House encourages guests to reuse their towels during their entire stay to reduce the amount of water and energy used. Reduced flow faucets in our guest rooms and throughout our facility, use of recycled paper products, and the use of environmentally friendly Aquafresco Filter Systems for reclaiming Laundry wastewater add up to substantial savings in all facets of our hospitality. As a member of IACC, a global association representing small to medium sized meeting venue providers, the Endicott House easily exceeds the standards of their Code of Sustainability. We have been recognized as a member of IACC’s Gold Tier, which means we demonstrate at least 85 percent of the organization’s 60 environment tenets. As a recognized environmental leader in the IACC, the Endicott House has kept our promise to focus on and improve our environmental practices in areas such as education and awareness, waste management, recycling, water and energy conservation and purchasing. As a meeting planner in today’s competitive business environment, it’s becoming an increasingly higher priority to choose venues that support your organization’s corporate sustainability efforts. Successful companies understand that winning in today’s marketplace goes beyond focusing on maximizing profits and bottom-line results. Instead, those companies who will sustain their success are the ones who combine not only their financial prowess, but their commitment to the world around them, which increasingly overlap as costs go down. All of us at the Endicott House believe strongly in sharing that mission. We, too, marry our goals of providing a high-quality, affordable meeting and retreat venue with guest rooms for small to medium sized businesses along with our passion for protecting and renewing our environment for future generations. By working together to meet our corporate sustainability goals, our company and yours can walk together into a successful and responsible future.